Pegasus Spyware: What you need to know now | Lookout, Inc.
On August 25, The New York Times, Wall Street Journal, Washington Post and many other media outlets covered Lookout and Citizen Lab's striking find: the most sophisticated, targeted, and persistent mobile attack ever found on iOS. The attack allows an adversary to silently jailbreak an iOS device and stealthily spy on victims, collecting information from voice communications, camera, email, messaging, GPS, passwords, and contact lists. With just a single tap the Pegasus attack has the capability to cause catastrophic data loss to a targeted individual or organization, completely compromising all communications from a smartphone — including data from end-to-end encrypted applications. CISOs and CIOs should read this post to learn the top five things to do now. Updating to the latest iOS version will unfortunately not remove or detect Trident if the device is already infected. If an attacker has already infected a device with Trident, updating to iOS 9.3.5, the latest version of iOS, will only protect against future infection. It does not remove the spyware itself or alert enterprises to infections. MDMs can only detect known jailbreak techniques. Pegasus used advanced exploits of zero-day vulnerabilities to jailbreak the device. Now that these advanced techniques are publicly known, we have not observed any MDM technology that is currently able to detect them. Encryption and VPNs are excellent tools that protect sensitive data in most situations. However, Pegasus has kernel level access to the device. This means the spyware sits in the path of all data, and uses “function hooking” to alter the legitimate app itself and intercept the decrypted communications. 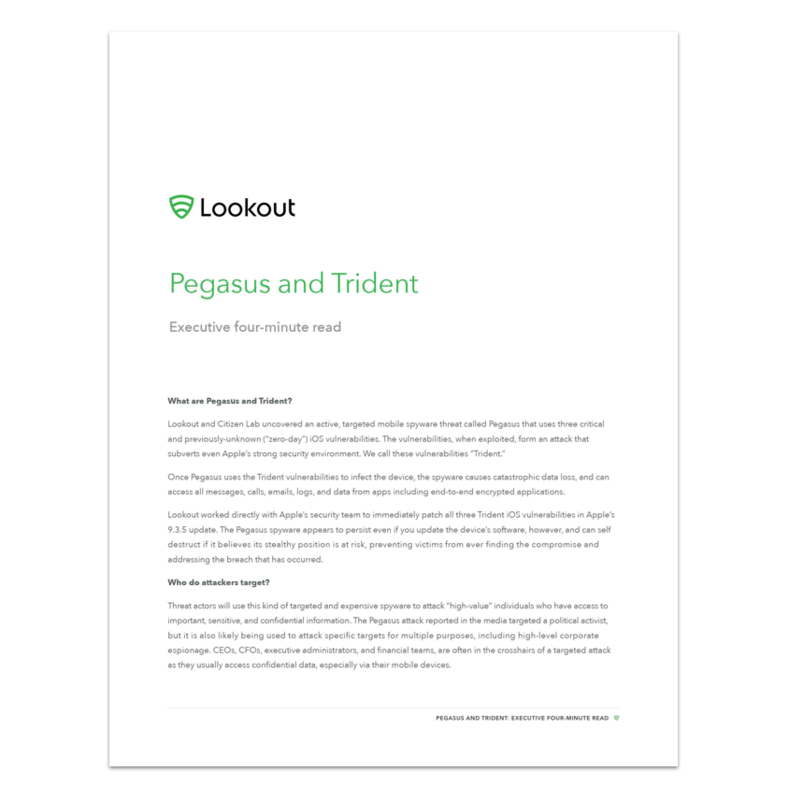 Get a quick overview and answers to the most frequently asked questions about the Pegasus spyware and Trident vulnerabilities from the Executive Four-Minute Read document below, ideal for CEOs and business executives. 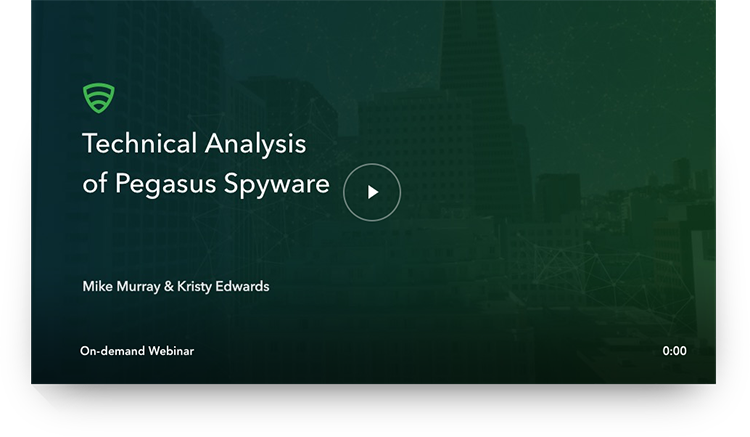 CISOs, CIOs, and Security Researchers should get a copy of the Technical Analysis of Pegasus Spyware, the most in-depth information available on this unprecedented attack, from the only security company with samples of Pegasus. Spend four minutes reading this executive brief for a complete overview of the Pegasus spyware attack on iOS, including answers to the most commonly asked questions, a summary of the media response, and unique perspective from Lookout. Read Lookout's investigation into this highly sophisticated espionage software. The attack takes advantage of how essential mobile devices are in our lives, spying on voice communications, camera, email, messaging, GPS, passwords, and contact lists. Watch this on-demand webinar to learn the technical details of Lookout and Citizen Lab's striking find: the most sophisticated, targeted, and persistent mobile attack ever found in iOS. Get visual, step-by-step instructions on how to determine if you've been affected by Pegasus. Congressman Ted Lieu urges the U.S. government to pay closer attention to mobile security. Learn how this attack directly applies to enterprises and how to protect sensitive data. Determine if your organization's iOS devices are still infected by Pegasus.